The current report says they lost another bumper/lip. The first time they lost a intercooler pipe, the 2nd time when they deployed the chute. Its going down in Texas for TX2K12. 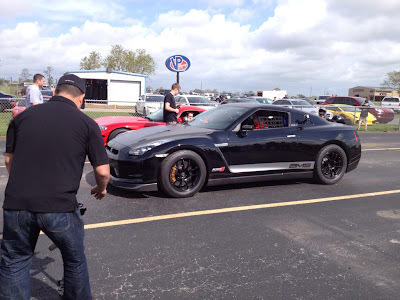 Most of the US top GT-R tuners are out for the Time Attack, Dyno, and Drag Racing in Houston, Texas. AMS has their Alpha Omega, 1600 horsepower Nissan GT-R at the strip, and has fired back at the 1/4 record set by SP Engineering yesterday. AMS were just 3 thousandths of a second slower down the strip, but ran 2 mph faster. Second pass of the day, the AMS AO went 8.796@169.43 mph. On that pass, they lost and intercooler pipe, which took out the front bumper and under tray. They should be back in action, trying to improve their times. The 60-130mph was 3.26 seconds on that pass. More updates to come as they get posted on the NAGTROC forum. Video after the break. The AMS car is making boost off the line, so they are probably not on the Cobb Accessport. Maybe Ecutek or Syvecs. Cobb had the ability to build boost, according to Thistle, but it had never been tested due to drivetrain fears. Ivan gets it pretty loose off the line, and even going down the track. Nice run.